Left to right, Principal Patrick Sukow, Terri Hodges, Superintendent Dr. Scott Elliott and Board of Education members Brenda Reece and Dr. Gary Childers. Blowing Rock School’s Terri Hodges was named Watauga County Schools district-wide Teacher of the Year in a surprise ceremony held Friday morning at the school. Hodges was presented the award by Superintendent Dr. Scott Elliott along with Blowing Rock and WCS central office staff. Each year, Watauga County School celebrates its Teacher of the Year candidate with a surprise ceremony. Hodges was honored in front of the school’s students and staff who awaited her entrance in the gym. This year marks Hodges’ fourth teacher of the year nomination since 1990, and Blowing Rock’s third-consecutive teacher of the year award. Hodges earned her Bachelor’s Degree in Middle Grades Education from Appalachian State in 1988 and has 29 years of experience in Watauga County Schools, spending all but one year of her career in Blowing Rock School. She teaches eighth-grade math and social studies. Blowing Rock Principal Patrick Sukow said Hodges was invaluable to the school — both as a teacher in the classroom, and a leader at large. Elliott said teachers like Hodges are an asset to the schools in which they teach. Watauga County Schools Teachers of the Year are selected by their peers at each school. The Watauga County Schools District-wide Teacher of the Year is chosen through a process that includes interviews, unannounced teacher observations in classrooms, and a review of a written statement of teaching philosophy prepared by each candidate. This year’s selection committee included Dr. Betsy Furr, Dr. Gary Childers, Eve Parsons, Preston Clarke and Jennifer Lacy. Watauga County Teacher of the Year Terri Hodges (right) along with Watauga County Schools Superintendent, Dr. Scott Elliott. School administrators and school board members were in attendance for the recognition of Watauga County Teacher of the Year. 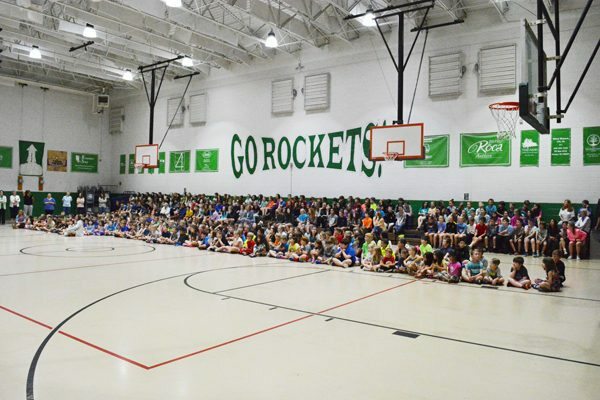 Blowing Rock School students packed the gymnasium for the surprise ceremony on Friday morning. Teachers and students fill the gym at Blowing Rock School to see one of their own receive the teacher of the year award. Terri Hodges and her husband as well as superintendent Dr. Scott Elliott (left) and Blowing Rock School Principal, Patrick Sukow (right). Students from Mrs. Hodges’ class celebrated with their favorite teacher.